Myths survive in the world for a reason. Just when they seem to have taken on too much tarnish, too much dust, an artful hand can reach out and wipe their surfaces clean, leaving the mysteries of a past before history shining as brightly as ever. In Daughter, Daedalus, Alison D. Moncrief Bromage’s debut collection and winner of the 2016 T.S. Eliot Prize for Poetry, the attentive reader finds himself tangled and then woven into a web of shifting perspectives, rich sonic effects, and reconsiderations of both what the self is and what it might contain. By re-approaching and modernizing the mythic figure of Daedalus, famous as an ingenious, nearly godlike inventor and as the father of Icarus, Moncrief Bromage brings the ancient into the luminous present. No myths that this reader found attribute any daughters to Daedalus, but that seems all the more fitting, as Moncrief Bromage has reimagined the primeval tinkerer in original and expansive terms. Not only is Daedalus the inventor of labyrinths, sails, dance floors, and living statues, but most importantly, as a father, he is co-inventor of a new self: an offspring whose being and consciousness harbor more questions than answers. In the book’s second section, the poet switches perspective once more, this time speaking as Daedalus. The work becomes transparent to the point of opacity, an effect that is endearing in the end. “Daughter, Your home will be” speaks from somewhere very old; the recognition that, evolutionarily speaking, all humans were once fish. Daedalus asserts “I am Atlantic / around the eyes, rough and salt worn / and you are spring fed, drooling / clear-faced.” This contrast from the voice of the collection’s first section is refreshing and moves the work gracefully along. In “Daughter, I will not remember when” we find several strange and startling inversions, archetypes that Moncrief Bromage has gently coaxed from their gnarled shells. When Daedalus says to his daughter “[f]rom the other room, you will call, surfacing / from sleep. I will answer in a voice you know by the way you will call,” we’re plunged into an endless continuum of speech and sound that cycles through both father and daughter. “Daughter, The butchers will slaughter” is a poem of halting irreverence and haunting subversion. Several years ago, after a reading I had given, a graduate student approached me to say that my poems were, in her opinion, “metal.” I faked gratitude for the remark, having no idea what she meant. “Daughter, The butchers will slaughter” brought that comment spinning back to me because it is indeed metal, standing out by refusing to turn away from the violent realities of its world: “The butchers will slaughter a flock of old laying hens / and will collect from their guts a bowl of yellow yolks, / unshelled and clustered like grapes.” When it’s revealed at the poem’s conclusion that “the butchers are nuns,” the reader is left with the blood in his ears positively ringing. The third section, entitled “Limbo,” diagrams a distorted sense of time, a journal that records not through inclusion but via incompletion. Quite suddenly we’ve left the magical atmosphere of the book’s first two sections for a more contemporary setting, complete with pontoons, oatmeal, and beer cans. 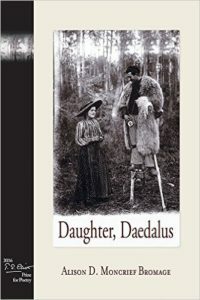 Daedalus still addresses his daughter here, but from a great remove, as if he has arrived as a nearly invisible and silent ghost wandering our modern world. “Nesting” remarkably calls up W.B. Yeats at his most mystical, where there is both “an order for all points to be equally / distant from a center” and “an order for the flesh of a center to hold.” The warped temporal space of this section is counterbalanced with the mythic world. Where the two meet, the old and the new still connect, still sparkle with the unknowable. The book’s closing section “Daughter, The Prologue,” hinges on two medium-length poems, “Twin A” and “Twin B,” that finish out the book and send the reader back through the mirrored structure of the whole work. The daughter discovers within herself a teratoma, or unformed twin (proceed to Google image search with caution, gentle reader! ), Daedalus’s last invention and proof that every world harbors smaller worlds, that this chain of creation goes on forever, expanding and further multiplying as we zoom in. In “Twin B,” the teratoma speaks, identifying with Athena, who sprang from Zeus’s noggin full-formed and clothed in armor. When the teratoma turns its words to the sister, we find Moncrief Bromage making one last foray into the history of creation, the foundry of myth: “We were one and then / cut down the middle // by the great unknown / and its ceremony— // were opened up / as the cavern / that began the world.” Every poem in Daughter, Daedalus moves the reader one step closer to Moncrief Bromage’s ambition: to revitalize the timeless act of explaining why the world is the way it is, not through history or science, but through the ingenuity and spark of the human imagination. More than ever, we need poetry to remind us of our smallness and powerlessness in a universe that we know only shadows of—we need poetry to retain our humility and our humanity. Daughter, Daedalus delivers. Daniel Rzicznek is the author of two poetry collections, Divination Machine (Free Verse Editions/Parlor Press, 2009) and Neck of the World (Utah State University Press, 2007), as well as four chapbooks, most recently Live Feeds (Epiphany Editions, 2015). His poems are forthcoming in The Massachusetts Review, Volt, The Pinch, and Sonora Review. Also coeditor of The Rose Metal Press Field Guide to Prose Poetry: Contemporary Poets in Discussion and Practice (Rose Metal Press, 2010), Rzicznek teaches writing at Bowling Green State University.